You might find it valuable to create a report or e-book from a presentation. While you may be familiar with creating handouts, you might want something longer or more structured. For example, you might want to include a table of contents and a cover. You can then make the e-book/report available for download, or even print it. It could become a valuable marketing or training tool, for example. 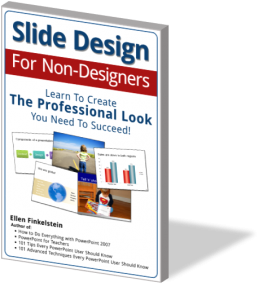 My e-book Slide Design for Non-Designers was originally an online presentation, but I’ve sold many more copies as an e-book. But how do you turn a presentation into a report or e-book? If you wrote a script or at least thorough notes, you can pour those into a Word document. You might even have started in Word. Note: Sometimes, people put the notes in the Notes pane, which is great for creating handouts, but not so good for creating a report or e-book. You can export to Word, using the Notes Below Slides option and then delete the slide images. If you’re up for using some VBA code, Steve Rindsberg has the code all written for you here. You can use your slides as images, especially if you created slides that are highly visual. To export the slides as images, choose File, Save As. Choose the location and name as usual. In the Save As dialog box, click the Save as Type drop-down box and choose PNG or JPEG. Then click Save. Choose to save all of the slides. You can now insert them as images into your report or e-book. Obviously, you want to place the slide images in the right place, next to the text that they apply to. 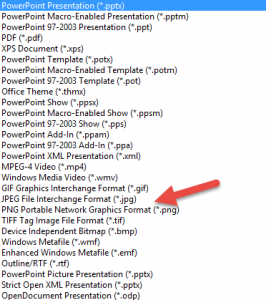 In Word, choose Square or Tight image wrapping to have full control over their placement. Use Word styles for consistency and so you don’t have to individually format each heading, chapter title, etc. Create styles specifically for chapter titles, headings and other features. If you’re creating an e-book, you might consider using a page size that’s like a paperback book, such as 6″ x 9″ instead of 8-1/2 x 11. If you’re using the metric system, adjust accordingly. If your content is long, you might want to add a Table of Contents. Word makes it fairly easy to automate this process. When you copy and paste, if the text looks wrong, use the icon that appears after the pasted text and choose the Merge Formatting. By all means design a cover! You can use the image of the cover to attract people’s attention. The cover doesn’t have to be fancy, but make the title font size big and use bright colors. Then insert the image of the cover before the first page of the report or e-book. How have you converted a presentation to a report or e-book? Share your experience in the comments! And also share this post using the Share buttons below because others might find these techniques valuable. In my experience exporting everything to word to create an e-book is a great solution during the initial development. But it leads to a maintenance nightmare in the future. I like to keep everything in PowerPoint as you can completely reformat/abuse the notes page, this way having to maintain only 1 document in the future. 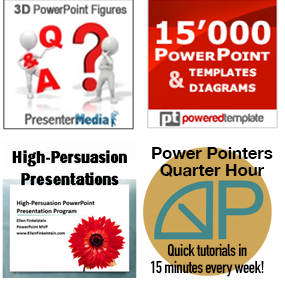 1 PowerPoint file that produces your presentation, ebook and even e-learning. I like your idea and think it’s right for a full learning solution. I was thinking of a situation that was more one-time, rather than ongoing learning. I have just developed a Powerpoint presentation with all speaker notes etc. My intent was to convert this to some sort of e-book, enhanced e-book or e-learning. Using the same file for all would be great. I am however, trying to determine what other tools you used to produce the great results you have for the e-book and e-learning for that matter. Dimitri, it depends on the situation. For ongoing training that needs regular updating, you’re right. In my situation, I did a one-time webinar but the e-book was the permanent product that I sold long-term. If I wanted to do another webinar, I’d go back to the e-book as the source. I had a script, which was a Word document. You could copy and paste your notes into Word. Then I created a Word document that functioned like a template. I took it from a previous ebook I’d written, but you can create your own. I just deleted the content and left the Chapter and heading styles, with sometimes a couple of words as placeholders. It had front matter (introduction, TOC, dedication, etc.) I gave it to my assistant and she copied and pasted. For the images, I exported the slides to pictures (File, Save As, and choose JPEG or PNG as the file type). I had a video recording of the webinar, so she watched that to see where to put the images in the text. With speaker’s notes, you could just go by those. Then I edited, adjusted some formatting, and exported to PDF.